Norway ranks #1 in every ‘Best Place to Live’ list and now I know why. What a magical little utopia they have going on there! When Norway discovered oil and gas in the '60s, they used that money to help the people (the only country I can think of that’s avoided the 'resource curse.’) Everyone is treated equally and poverty doesn’t exist. Everyone has a home and job who needs one. Yes, taxes are high, but no one goes without and the benefits can be seen everywhere: Norway ranks the best in education, income, health…the list goes on. Though not outwardly affectionate, Norwegians care about each other, are responsible and consider the greater community when making decisions. Most of the food they eat is local; they know the farms where their food comes from and like supporting their neighbors. Their favorite reality shows are 1) a community of people with Downs Syndrome and 2) a hiking challenge for disabled people. They like these programs because they enjoy cheering these people on rather than cutting them down. They pick berries in the summer and mix them with sugar. In the winter, they add water to this mixture for a fruity drink called saft. They recycle. The list of why Norway is awesome goes on and on, but you get the drift. 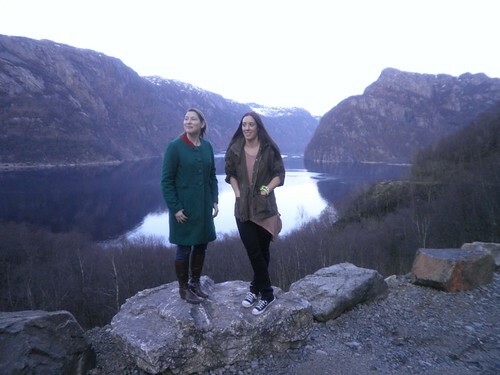 I’d never given the country much thought and almost didn’t go on this trip–Norway in the winter? COLD–but I’m so happy I did. Just another reminder of why you should take advantage of the opportunities that come your way, even if you didn’t seek them out. 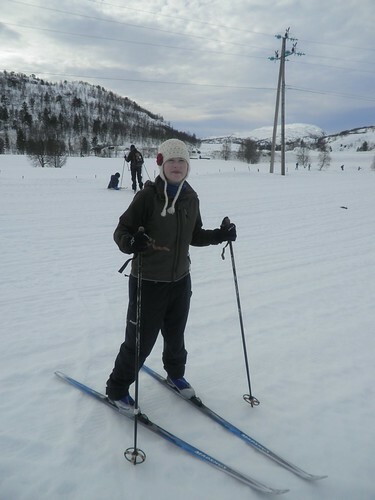 My friend Elizabeth and her husband, Kjetil, invited me to go skiing with them. 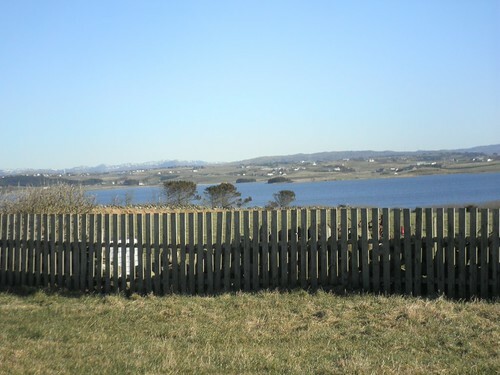 He’s Norwegian and we spent our first night on his parents’ farm, which overlooks this gorgeous view. 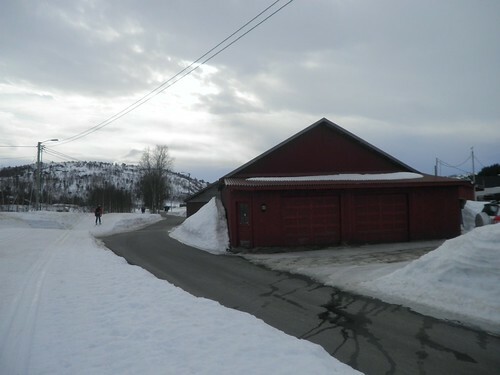 They live in southern Norway, near Stavanger, and the land here is much flatter than the rest of the country. You can no longer build in this area because the government wants to preserve the farms. 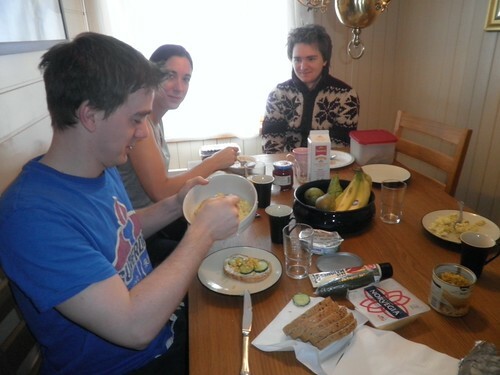 As mentioned before, Norwegians produce most of the food they eat and they’d like to keep it that way. Kjetil’s family’s farm looked quite big to me, but they told me that almost all the farms are run by one person without any extra help. So his dad milks the cows and takes care of all the vegetables himself. The horrible conditions found in U.S. factory farms don’t exist here because laws dictate the humane treatment of the animals. Having said all that, the Norwegians aren’t monks. They do like to spice things up sometimes and have become big fans of tacos. 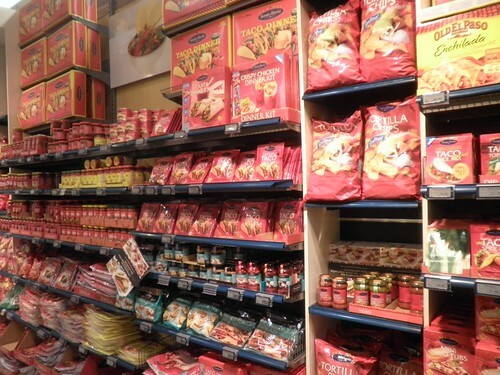 This selection in the grocery store is four times what you’d see in a British market. 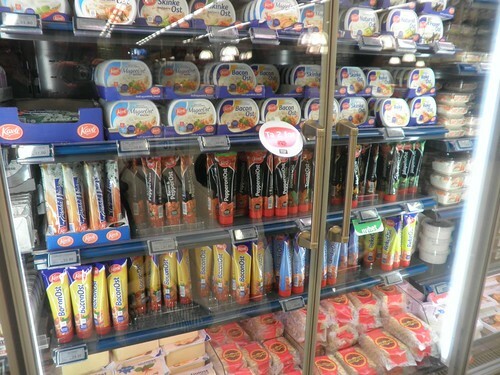 That’s cheese in those tubes, though i was assured it was real cheese and nothing processed or fake. The tubes make it easier to take on hikes. Enjoying the view with Elizabeth. 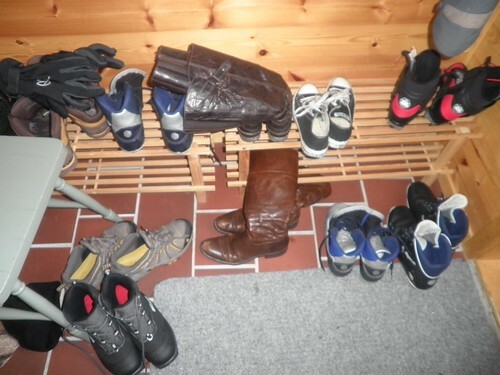 Reason 546 Norway is so glorious: Shoes come off upon entering every house (or cabin, as seen here). Dirt stays in one area and does not get tracked in. The Swedes (who occupied Norway for a long time) do the same thing. I didn’t break a leg or knock out any teeth, and so declared my afternoon of cross-country skiing a success. …hot dogs. 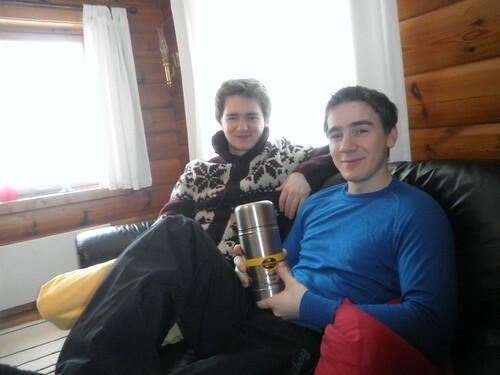 Kjetil’s brother, Jone, is holding his hot dog thermos, which he likes to take skiing. This is a common thing. Friday night was taco night! They like to put corn and cucumber on their tacos. 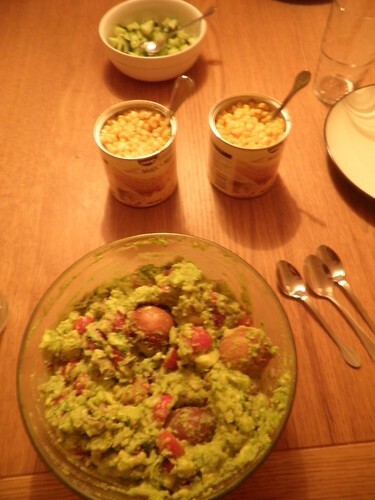 Not sure if they’re into guacamole, but they enjoyed the batch Elizabeth made. 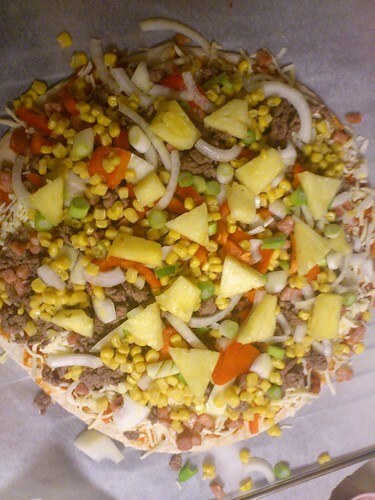 On Saturday, the Norwegians made pizza for us. Their English is almost perfect, but they usually say 'much’ instead of 'a lot.’ When Jone asked me, with a big smile, “Sarah, would you like much cheese on your pizza?” I found it too adorable to correct. Our cabin was great, with two bathrooms and all the modern conveniences we needed. A healthy breakfast. I should have taken a photo of all the candy they ate! 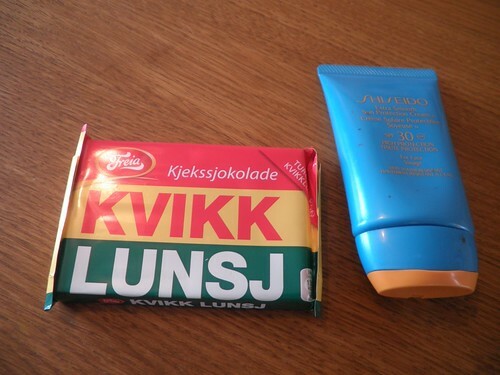 Norwegians generally only eat sweets on Saturday or when they are on holiday, and they went through bags and bags of chocolates, salted licorice and all sorts of weird gummy things. 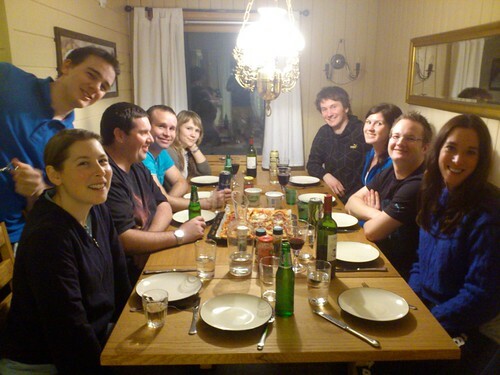 We had eight Norwegians with us and two Americans (Elizabeth and I). 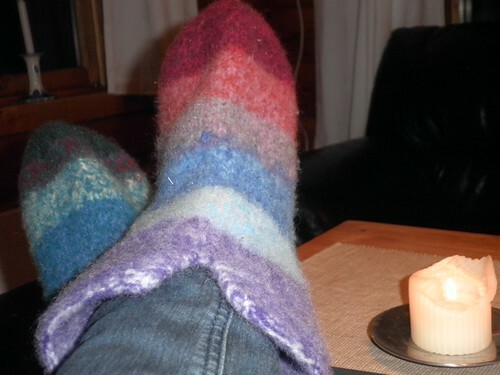 Boiled wool slipper socks! 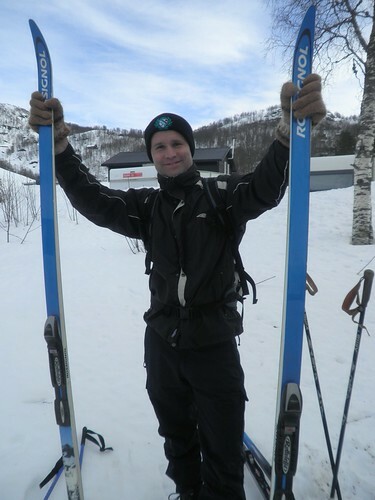 Kjetil’s mom let me borrow these, along with her ski gear (she had a ton!). She likes knitting and I’d love to commission a sweater from her. 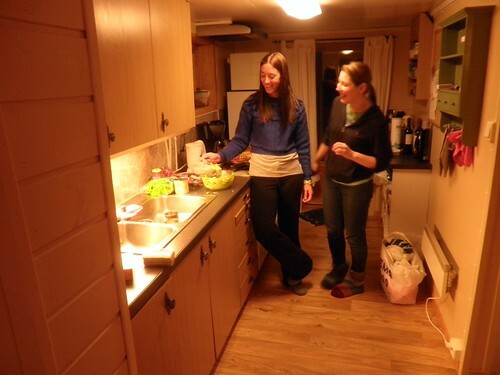 All the kids in Norway, including the boys, learn to knit and cook in school. Oh, didn’t I tell you? 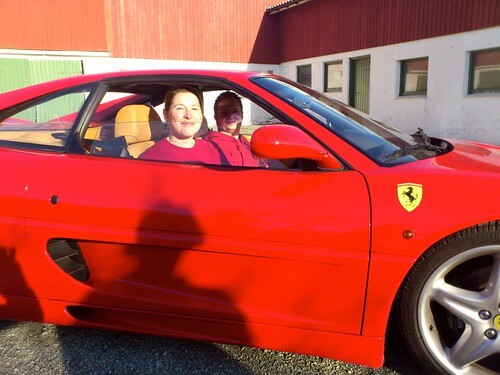 I only ride around in Ferraris now. I actually feel less carsick in them than in normal vehicles. Perhaps it’s the thrill of going so fast in a beautiful foreign country. 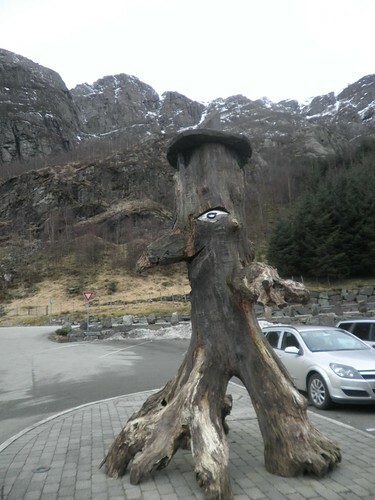 Some sort of wooden elf or troll. 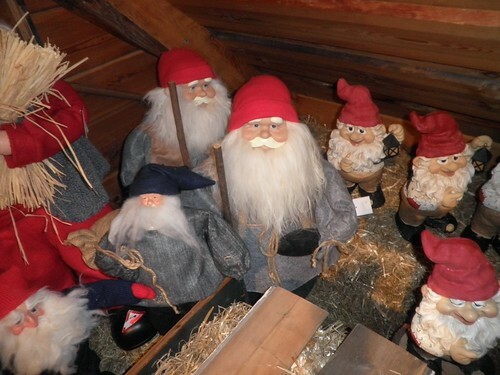 Nisse, the Norwegian Santa. The short, mythical man watches over the barn and the farmer’s family. He generally serves to protect, but if you fail to leave him a bowl of porridge on Christmas Eve, he’ll play tricks, such as braiding your horse’s tail or moving the animals around. Oh Norway. You’re too cute for words! !